BB-5, as a Depression, has crossed the coast at 21.8N and 87.1 E near the Odisha/West Bengal border. As can be seen from the Satellite image , super-imposed on IMD image, the maximum effect of rainfall and clouds are seen in the Western quadrant of the system. Core estimated pressure is 993 mb. Outer periphery winds are around 40 kmph. System will track NW and weaken, initially at the surface level and remain as a UAC for another 2 days. 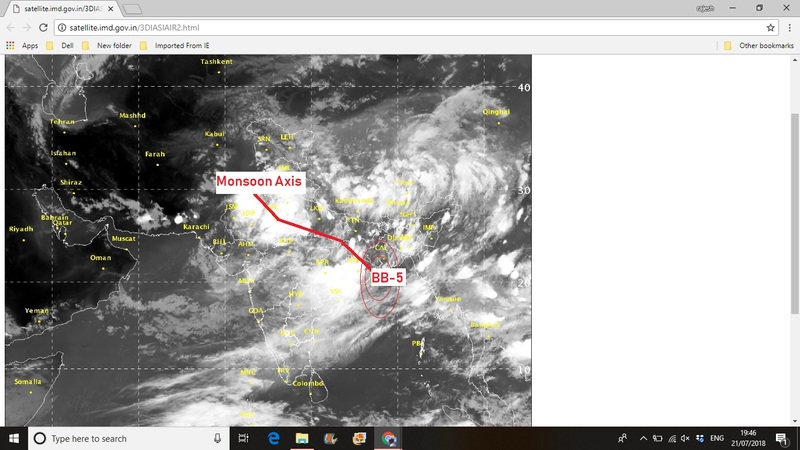 As the system tracks NW, along the Monsoon axis corridor, the rains will move across Chattisgarh and Bihar (much needed) and U.P., and gradually weaken in Odisha. Tuesday onwards the NW plains including Delhi and Haryana will get heavy rains. Vidharbha region may get good rains on Sunday 22nd. An Upper air axis will hence form from North Gujarat to U.P. Inter action with another embedded UAC will bring good rainfall to Rajasthan, North India plains in 2 days from Saturday (next week). For Pakistan most of the rainfall, the major part, from BB-5 is seen in the North and Upper Central regions from Monday. No major meaningful rains in Sindh. Break Monsoon conditions may prevail after 26th as BB-5 moves into the Himalayan foothills. Meaning, widespread rains in Uttarkhand, U.P. and NE States. Break Monsoon conditions will reduce rains in the Central Indian region, and Peninsula. Delhi NCR: Heavy rains will commence on Tuesday 24th and continue thru Wednesday and Thursday. Day temperatures Thursday can drop below 30c. Sunday 22nd and Monday 23rd: Very windy. Occasional passing showers, some heavy. Days may be interspersed with bright periods. Tuesday: Decrease in rainfall amounts with partly cloudy skies. Substantial decrease in rainfall after 26th July. Surat: Chances of heavy rains on Monday 23rd and Tuesday. Decreasing thereafter. Thanks Rajesh for such a clear and lucid explanation. As always the South West Monsoon has delighted us this year too, almost covering every region. Of course there will also be regions where it has been deficient. But when we humans have deficiencies ourselves, I think we will have to give that liberty to Nature too. And that is why I love your blog title - Vagaries of the Weather. Sums it up beautifully. And like I say always, it is an added delight to enjoy the monsoon ride through your views and observations. Meaningful rain chance north gujarat ? for north gujarat ....in vicinity of ahmedabad , gandhinagar ..heavy rains possible? Mumbai water supplies should be in good shape till the next monsoon. Will Jabalpur get good rain from BB5 ? Have a doubt......while coming to Mumbai from Dubai on 5 July I noticed that dark monsoon clouds started to appear only in the last 15 minutes if the flight duration(200 Km from Mumbai). Even last year monsoon I noticed this. Why so? Sir can u please clarify my doubt? 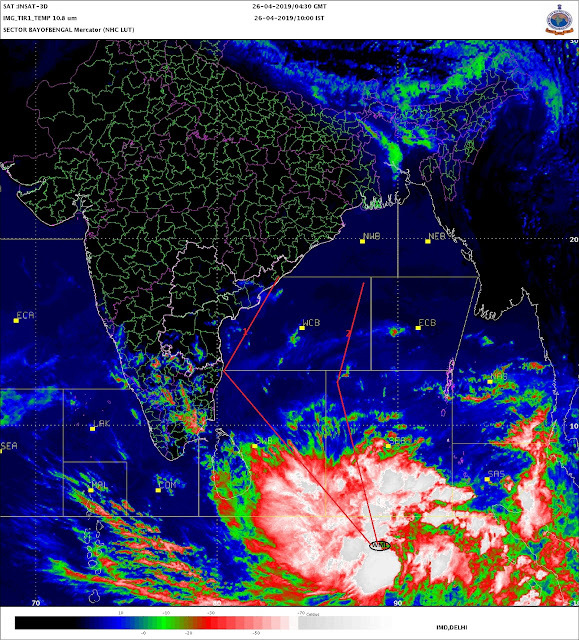 It has rained everywhere except south east India (Tamil Nadu, south Andhra, interior KAR - no rain). since 2015 NEM has failed. Seems only strong el-nino can help in early withdrawl of SWM. Infact Rajisthan has been continuously receiving excess rains since last 5 years. RAJ no longer dry state anymore! @Cumulus Arjun - By dark monsoon clouds, I presume you mean to say the low level clouds which give rain to west coast...yes they form only few km of the shore...the other clouds which you see on the satellite imagery over Arabian Sea are mostly medium to high clouds...rain giving low startocumulus/cumulus/nimbostratus will form few km off the shore and over konkan...feature of offshore trough and SWM.